Summertime is upon us and the weather has certainly been a treat. We know the opportunity to take those afternoon and early evening strolls has been eagerly anticipated by so many of you and with the continued revitalization of Downtown Smyrna, there’s never been a better time to come through and check out what our historic town has to offer; from the landmark buildings to the many new businesses and everything in between. We here at The Drunk’n Baker have loved seeing so many new faces, as well as our many regulars who come to see us every day. Perhaps you are new to town or haven’t driven through recently and you are unfamiliar with The Drunk’n Baker. Well, we’re your one-stop shop for all of your pastry and light meal needs; whether it’s breakfast, lunch, that much needed (and well deserved) mid-day snack or who could forget – dessert! We offer a wide range of treats that include both sweet and savory, so you’re sure to find something that hits the spot, be it an old classic or maybe a new favorite. Our bakers use the freshest ingredients without the preservatives, which means you and anyone you may be spoiling get to indulge without all of that guilt. Wait, lunch? That’s right! 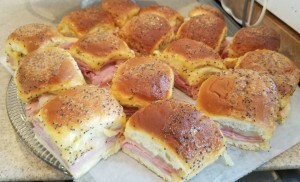 The Drunk’n Baker is pleased to offer daily lunch specials. Our aim is to be an alternative to the barrage of fast-food choices, yet still offer items that are quick and easy for those of you on the go. We have really been pleased with the positive response we have received over the last couple of months and we encourage you to stop in and see what all the buzz is about. 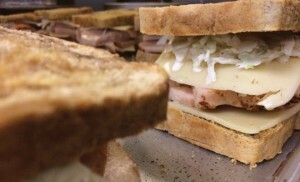 As one of our loyal customers put it, “it’s the kind of items I would put in my brown bag lunch” and we always strive to keep our lunches in the $5 – $7 price range. We offer wraps, sandwiches, sliders and more, all made in-house; and all of our lunch specials can be purchased as a combo which comes with your choice of a beverage and one of our many varieties of cookies. Recently, we’ve expanded our lunch menu, for those of you looking for an even lighter fare. We are now pleased to offer pasta salad, potato salad, cucumber salad and more. Follow us on Facebook to see our specials of the day. Of course, as always, we also love to see all of our many customers who aren’t “on the go”. Whether it’s sitting and enjoying a cup of coffee (we have 6 roasts available daily), iced coffee, hot or iced tea; reading the newspaper (yes, they still make those) or taking a break and playing one of the board games or puzzles we have in stock, we truly enjoy all of you who come in and hang out with us! So, where does the name The Drunk’n Baker come from? Believe me, it’s a question we hear all of the time and are always more than happy to answer. Our bakery specializes in, get ready for it . . . alcohol-infused treats!! Spirits, cocktails, wines and beers; you name it and our bakers have worked it into a sinfully delicious concoction at one point or another. One of our most popular creations is the Time Warp Truffle, which uses the Time Warp Espresso Vodka available from The Painted Stave, another one of Smyrna’s thriving small-businesses. We have also been very proud and delighted to partner with Delaware-based businesses: Blue Earl Brewing Company, Harvest Ridge Winery and Fordham and Dominion Brewing Company for some wonderful events and to incorporate their products into our treats. We really look forward to more pairings as both we and these other great local businesses continue to grow. Special orders are always welcome at The Drunk’n Baker. While most orders only require 48 hours, the earlier the better to secure a spot. 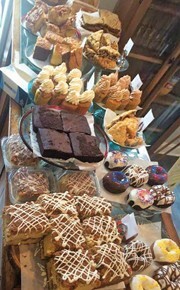 Customers can choose from our more popular selections or work with the bakers to come up with that unique dessert or tray that is perfect for the occasion! We also sell all of our coffees by the box, so you can look like the hero at your next office meeting (or to keep for yourself if you really, really like coffee – we don’t judge). 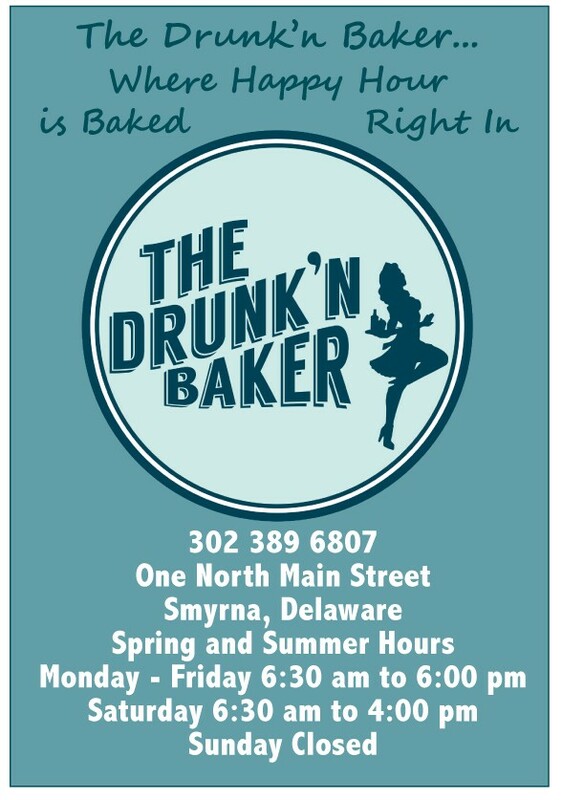 So next time you’re in Downtown Smyrna, taking a stroll or a break from that dreaded beach traffic, stop in and see us at The Drunk’n Baker, where Happy Hour is baked right In!